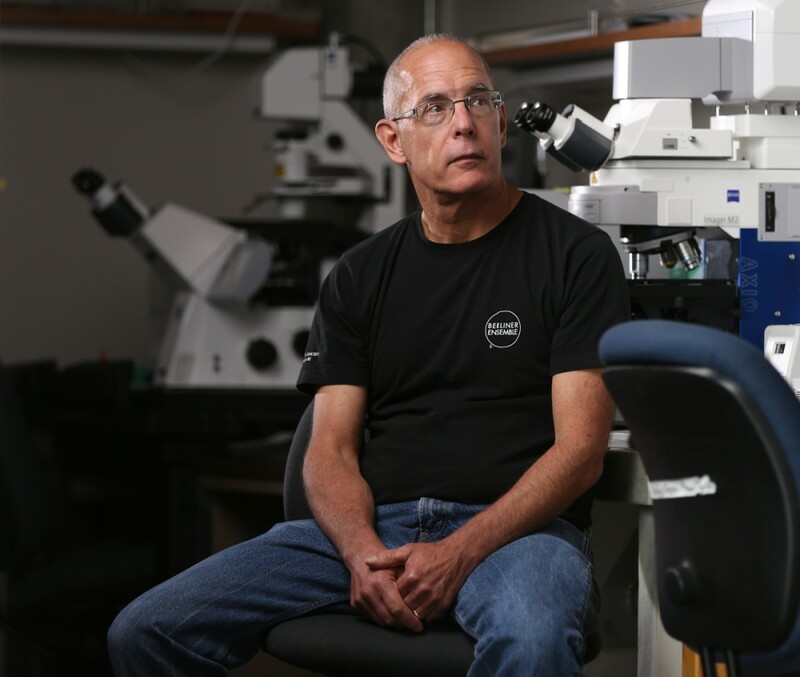 UO biologist Chris Doe, a professor in the institutes of Neuroscience and Molecular Biology and a Howard Hughes Medical Institute investigator, has been elected to the National Academy of Sciences in recognition of his work in cell development, including neural stem cells and the development of the central nervous system in fruit flies. “I’ve had lots of really good people in my lab who have allowed me to do what I’ve done over 30 years and it’s nice to think back on all of those people and their role in this,” Doe said. Doe has spent most of his career examining the stem cells of the developing fruit fly brain. His work showed how spatial patterning cues create different types of stem cells, how stem cells divide irregularly to regenerate the stem cell while continuously producing neurons, and how stem cells possess a “molecular clock” that allows them to make different types of neurons over the life of the stem cell. Most recently he has been investigating how neurons from different stem cells "wire up" to make neural circuits that generate different fruit fly behaviors. Fruit flies provide a simple model for studying genetics and brain development because they have short life cycles, are easy to care for, breed quickly and produce large numbers of embryos that can be modified to pursue various scientific questions. Some 75 percent of genes linked to human diseases are also found in fruit flies. Since coming to the UO in 1998 Doe has racked up an array of career research achievements, including being named to the American Academy of Arts and Sciences in 2014, receiving a National Institutes of Health MERIT award in 2013 and being awarded an Oregon Medical Research Foundation Discovery Award for lifetime achievement in 2011. Doe was one of 84 new members chosen by the academy, which was founded in 1863. Another 21 foreign associates also were chosen for their distinguished and continuing achievements in original research. He joins seven current or retired UO faculty members — Frank Stahl, Peter von Hippel, Michael Posner, Brian Matthews, Geri Richmond, Eric Selker and Paul Slovic — as active members of the academy. A ninth UO faculty member, psychologist Helen Neville, a native of Canada, was elected as a foreign associate in 2014. Members of the National Academy of Sciences provide science, technology and health policy advice to the federal government and other organizations. The private, nonprofit academy was established under a congressional charter signed by President Abraham Lincoln. “Membership in the NAS is one of the highest honors awarded to scientists and we congratulate professor Doe on this tremendous achievement,” said David Conover, UO vice president for research and innovation.